Located on East 79th Street at the corner of Fifth Avenue and across from Central Park, sits one of New York City’s last turn-of-the-century, French-Gothic styled-structures. Designed by Gilded-Age architect Charles Pierrepont Henry Gilbert, the building was home to Isaac D. Fletcher and Harry F. Sinclair, giving it the fitting name of the Fletcher-Sinclair Mansion. 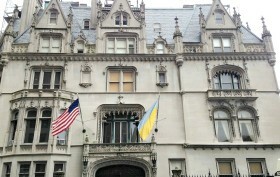 Now, the mansion is occupied by the Ukrainian Institute of America, a nonprofit organization that has promoted Ukrainian art, music and literature since 1948. Ahead, join 6sqft on a tour of the landmarked building and check out some of the unique features within this hidden-in-plain sight New York City architectural gem. Earlier this week, the Ukrainian community rang in the new year, so we thought it appropriate to take a look at one of the city’s largest centers of Ukrainian-American life. 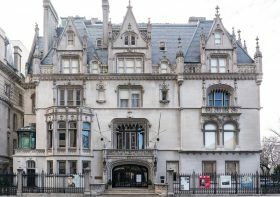 Located at 2 East 79th Street at the corner of Fifth Avenue, the Fletcher-Sinclair mansion was built in 1897 by famed architect Charles Pierrepont Henry Gilbert (C. P. H. Gilbert) as a single-family home for Isaac D. Fletcher, a banker, broker, and railroad investor. Today, the French Gothic masterpiece houses the Ukrainian Institute of America, a nonprofit organization dedicated to promoting the art, music and literature of Ukraine and the Ukrainian diaspora. But how did this massive home become home to the Institute?